While patients with advanced stage cancer are generally treated by hem/oncs or med oncs there are several tumor types that involve specialty areas beyond oncology. In the case of advanced prostate cancer, urologists play a key role in disease management and this is clearly reflected in promotional efforts. 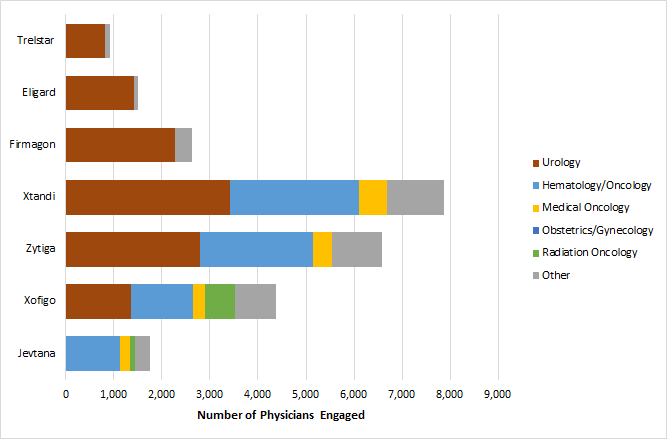 In the figure below we’ve used the MDDetails platform to chart paid physician engagement for a number of products which play in the space. Androgen deprivation therapy (ADT) is recommended as the initial treatment for advanced stage prostate cancer and is then typically followed by a secondary hormonal therapy (e.g., anti-androgen). Chemotherapy is generally reserved as a later line option. Interestingly, we see a very strong correlation between line of therapy and promotional focus. Engagement activity for the ADTs (i.e., Trelstar, Eligard, and Firmagon) is focused within urology, whereas promotion for the anti-androgens (i.e., Xtandi and Zytiga) is clearly split between urologists and oncologists. Furthermore, promotion of Jevtana (chemotherapy) sits exclusively within oncology. Note that Xofigo is somewhat of a complicated case as it contains radioactive material (radium 22) and requires coordination with a radiologist. How we can help: MDDetails tracks promotional activity across hundreds of disease areas and can provide a data-driven perspective on market specific coverage and specialty mix requirements.